Master 4 Series Classic LXS SBS brings together robust materials and exclusive features in one modern design. This barbeque is perfect for gourmet aficionados who wish to have the same cooking luxuries from indoor to the outdoors. The most sophisticated technologies, such as Even Temp® Technology, the Campingaz® Culinary Modulars to cook and bake various styles of dishes, or the practical InstaStart® ignition system with individual backlit knobs are all integrated in the Master 4 Series Classic LXS SBS. You’ll enjoy the freedom of cooking all year round, confident that you will have the ultimate barbecue performance at your fingertips. A new coating further improves the Campingaz InstaClean® System and allows pre-cleaning before your dishwasher removes the remaining grease. 10 years Warranty on Master Series Stainless Steel Burners and Stainless Steel Lid as well as 5 years Warranty on Cast Iron Grids. The Campingaz® Searing Boost Station (S.B.S.) delivers the intense heat that is needed to sear steaks in seconds with beautifully charred stripes, giving that authentic steakhouse flavour without the risk of overcooking the meat. Thanks to the additional burner of the Campingaz Searing Boost Station, the enamelled cast iron grid absorbs the extreme heat allowing you to beautifully brand the meat with the classic barbecued stripes. Impress your guests with the new Searing Boost Station without compromising on taste and texture. After extensive reaearch, the unique Campingaz InstaClean® system has been improved. The new Master Series collection features an InstaClean® firebox which has a special surface treatment to make cleaning your barbecue even easier. These removable parts with the new treatment reduce the amount of grease and burnt particles from sticking to the grill and with ease, you can just brush them away before getting the final clean in the dishwasher. 4 Series RBS EXS, 4 Series RBS LXS, 3 Series RBS L, 4 Series Cast Iron EXS, 3 Series Cast Iron EXS, 4 Series Classic LXS, 4 Series Classic LS Plus, 4 Series Woody LX, 3 Series Classic LS Plus, 3 Series Woody LX. This special type of electronic ignition is a convenient push and turn-button lighting system designed specifically for our gas barbecues. Simply push and turn the button to ignite your barbecue. Get ready for the new strong and durable stainless steel tube burners for long lasting and enjoyable BBQ sessions! 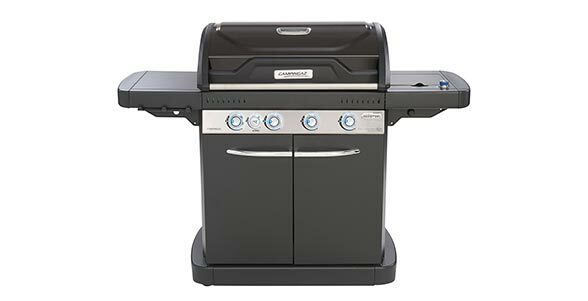 Enjoy great cooking performance with this smart burner system designed especially to perfectly grill all types of foods. How does the Stainless-Steel-Burner System work?